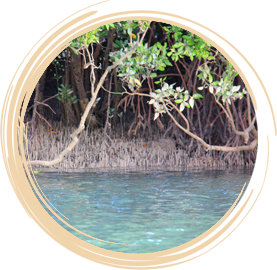 Mangroves are a group of plants that are all adapted to live in the intertidal zone (the area between high and low water marks). They include a wide variety of species including trees, shrubs, palms, ground ferns, climbers and grasses. protect our coastline by creating a buffer from storms and reducing soil erosion, filtering pollutants from land run off, and trapping silt and sediment. are important nursery areas for many marine animals. form the base of rich food webs based on the breakdown of detritus – mostly leaf litter and mangroves themselves. In Western Australia, mangroves are most common in the Kimberley and Pilbara regions, Exmouth, and Shark Bay.